We all know the importance of water—our bodies are mostly water, we need it to survive, it’s the second most important ingredient in coffee… Geologically, it facilitates almost everything we know, from erosion to magma formation to rock fracture. I’m often struck by how so many of water’s unusual properties are determined by its chemistry and molecular structure –and in a very understandable way. waterfalls in Fjordland, South Island, New Zealand. Many of water’s properties stem directly from its polar nature –and its polar nature comes right from its molecular structure. Here’s how. The water molecule’s two hydrogen atoms bond to the much larger oxygen atom in a way that forms a near right triangle. As a result, the hydrogens crowd one side of the oxygen while leaving the other side open. 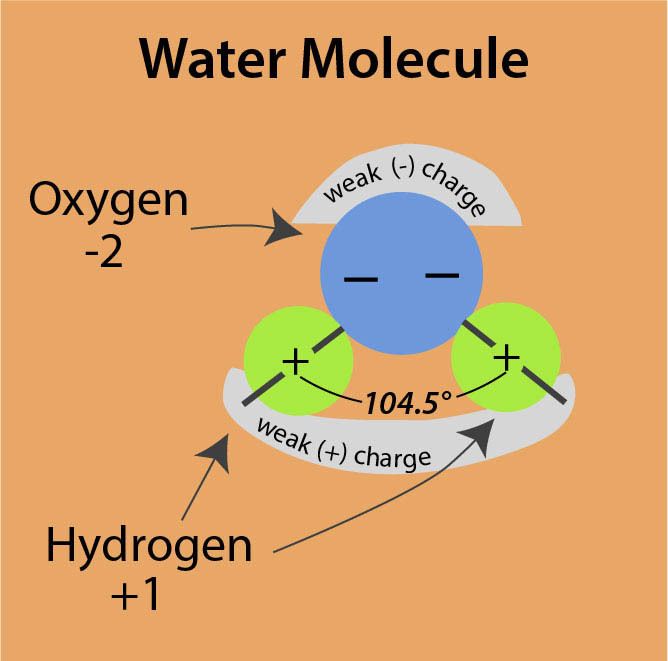 This asymmetry creates water’s well-known polarity: even though the two hydrogens and one oxygen balance each other, a slight positive charge exists on the side of the hydrogen atoms and a slight negative charge exists on the far side of the oxygen. And it’s this polarity that, among other things, creates water’s capillary action, its surface tension, its amazing ability to dissolve things, and its powerful ability to buffer extreme temperature changes. The diagram below shows multiple water molecules –and even though they’re separate, they’re connected. The slight positive charge on the side of the hydrogen atoms of one molecule bonds with the slight negative charge on the hydrogen-poor side of another molecule. These bonds, called hydrogen bonds, are weak, but they keep the molecules together. This “stickiness” gives water its surface tension, which lets water extend over the brim of a cup, form large drops that beautifully reflect sunlight, or support creatures like water-striders that move over its surface. 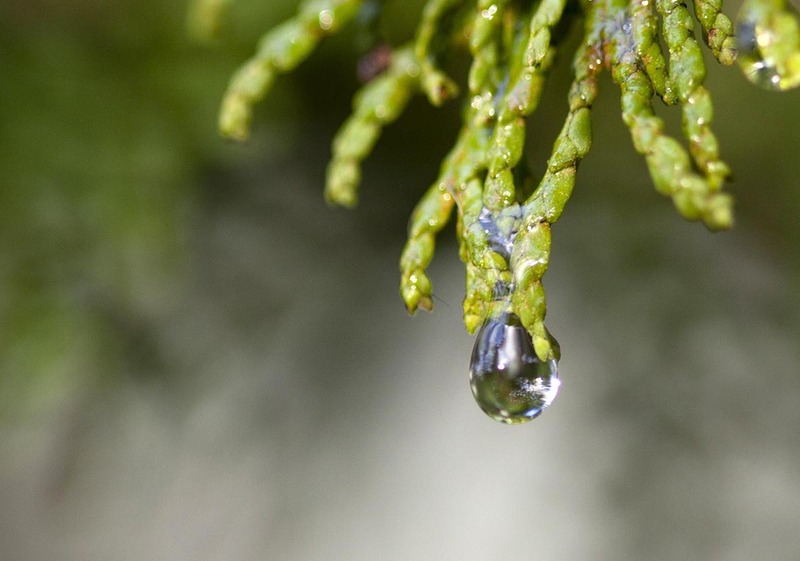 It also gives water capillary strength, so that trees, for example, can carry water up into their canopies. The salt crystals that grow upwards from cracks in Death Valley’s salt pan give a dramatic example of capillary action. Water that ends up on the salt pan dissolves the salt and sinks into the ground. As the air temperature warms, however, water still on the surface begins to evaporate, which pulls the water just below the surface upwards by capillary action. In turn, that upward-moving water pulls the water below it upwards and so on. What’s more, as the water evaporates, it leaves behind salt, crystallizing into needles and ridges that grow upwards. Salt crystals in Death Valley, California. Left: new salt crystals growing upwards from damp valley floor –note concentration along cracks. Right: After months to years of crystallization, large polygons of salt are separated by raised, salt-filled fractures.